is a leadership program coordinated by Rotary Clubs around the globe. Each year, thousands of young people participate in this program. Our RYLA Program, organized by District 6400, is a leadership skills course for nominated high school students between grades 9-12 who want to improve their leadership potential. 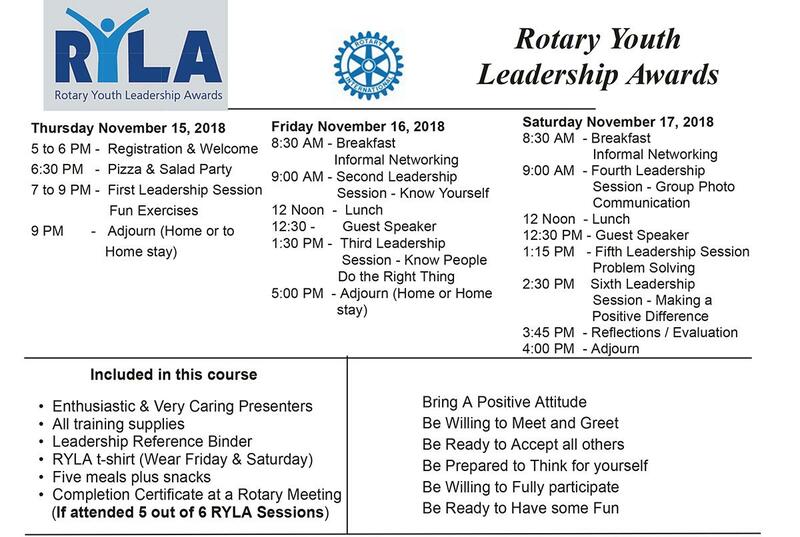 RYLA is about education and practicing some basic Leadership Skills, Doing the Right Thing, Making a Positive Difference plus having opportunities to meet and greet like-minded people who hope to be leaders in their school, community and beyond. Don’t miss this fantastic opportunity to participate in this extremely worthwhile training seminar. Print out the application form, fill it in and email it to larkindon@aol.com. Don't wait - spaces fill up FAST - apply today! Course takes place between 5:00pm Thursday, November 15th through 4:00pm Saturday, November 17th.